After years of being in decline, veteran guitar company Gibson Brands Inc. has filed for bankruptcy protection. The company announced the news early Tuesday morning, after filing for chapter 11 in a U.S. Bankruptcy Court in Delaware. Talk of the guitar company facing imminent bankruptcy began earlier this year as reports came in that creditors were becoming antsy about the company’s ability to pay off its loans and about the company’s poor decision making behind-the-scenes. A Bloomberg report states that the company owes as much as $500 million to its lenders, with many outlets, including The Wall Street Journal, placing the blame on Gibson’s acquisition of some home entertainment and audio equipment makers years ago. Gibson CEO Henry Juszkiewicz bought the home and audio entertainment business from Koninklijke Philips NV for $135 million in June of 2014 as part of a rebranding effort to make Gibson Brands Inc. a “music lifestyle” company. 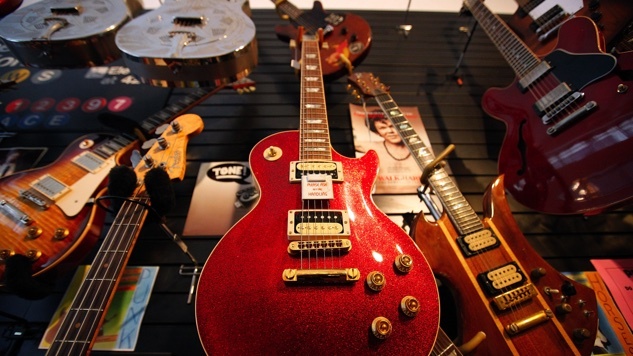 The guitar company also took on debt after purchasing a line of consumer electronics, the Japanese company Onkyo Corp. These ill-advised purchases became the bane of Gibson’s existence and the source of their financial woes. As these acquisitions drained money from the company’s pockets on the business side, the guitar manufacture faced pressure on the production side, as new import regulations on rosewood made it harder for Gibson to acquire the resources needed to manufacture their high-end instruments. With Gibson now officially going bankrupt, the company has come up with an “exit plan” to bring them out of their financial predicament. Gibson has laid out a restructuring strategy that gives equity ownership to some the company’s loan-lenders who, in turn, have promised to provide a new loan of $150 million to keep the guitar company afloat. Brian J. Fox, a managing director at Alvarez & Marsal, will serve as Gibson’s chief restructuring officer. As of yet, no news has been divulged regarding whether Juszkiewicz will continue on as Gibson’s CEO, or transition into another role. Fox told Bloomberg that while the company was able to make an agreement with the major constituents to its musical instruments business, no agreement was made on the consumer electronics business end. These consumer electronic acquisitions will be liquidated, according to court papers, in an attempt to “unburden” the company from the source of its financial troubles. Gibson has been in business since 1894, selling over 170,000 guitars annually in 80 countries. Their American-made guitars have become iconic in rock music after being played by legendary musicians like B.B. King, Angus Young and Jimmy Page, just to name a few. Even in a downturned economy, sales of the brand remain high, with vintage versions of models like the Les Paul, Sg or Flying V re-selling for thousands of dollars. Hopefully the guitar company can come out of their financial valley and continue making peak instruments for rockers everywhere in the years to come.